Alpha Psi zetes in Oshawa. 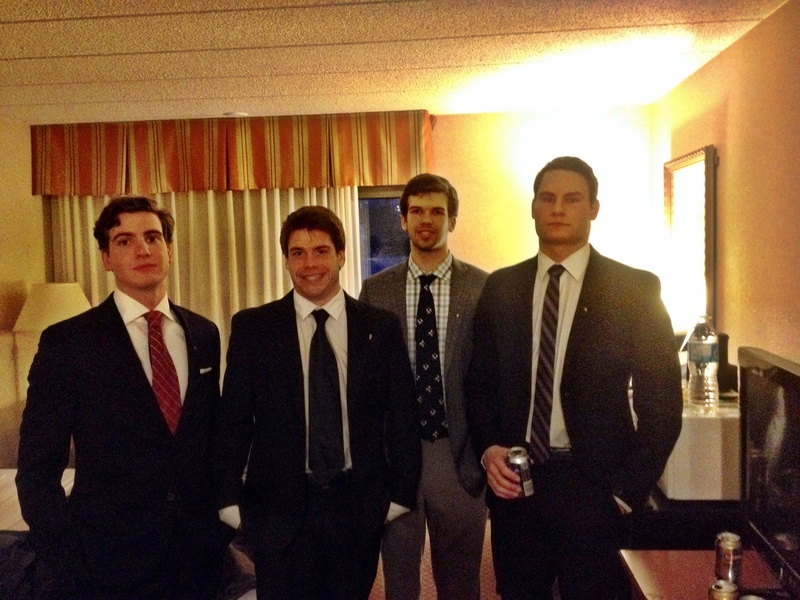 From left to right, Phi Marco Peghini, Steven Curran, Stephen McGuire, Antoine Crosby. During McGill’s Reading Week March 3rd-9th, the brothers from Alpha Psi took to the road to visit other chapters in Canada and in the US. Among those traveling were Brothers John Hopkins-Hill, Stephen McGuire, Antoine Crosby, and Marco Peghini. These four piled in a car in an ambitious journey to visit 8 chapters in 8 days. The first stop was the 9th Annual Chartering Banquet hosted by the Tau Theta chapter in Oshowa. Following this fantastic evening came the journey to the States to visit the chapters at Cornell, the University of Maryland, North Carolina State University, Virginia Tech, and Case Western Reserve University. The brothers returned to Canada to stop at Brock University, and finally the Theta Xi chapter in Toronto. Highlights included a snow day in Maryland as brothers at the Phi Epsilon chapter had the day off from school as well as good times and camaraderie held by all as Alpha Psi made the trek to visit our fellow brothers. We are grateful for the hospitality shown us at each and every stop and continue to invite all brothers to visit us in Montreal as well. Alpha Psi visits Alpha Mu for 75th anniversary banquet.